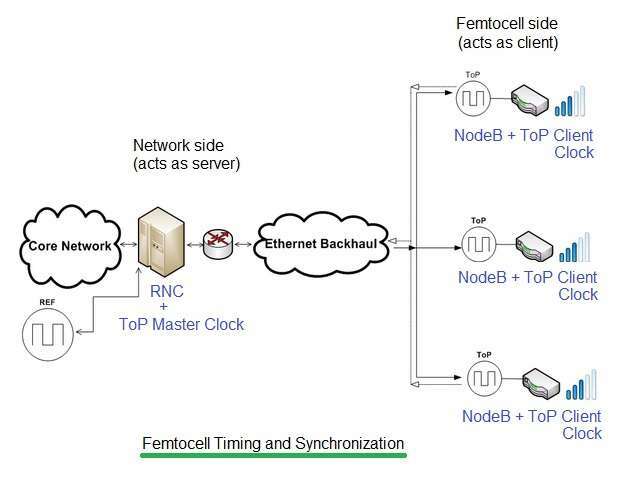 This page on Femtocell tutorial covers femtocell timing and femtocell synchronization. The figure depicts femtocell timing and synchronization process. As we know femtocell is interfaced with core network using IP backhaul. As femtocell is deployed indoorm, hence it can not use GPS services. It uses timing protocols such as IEEE1588 and NTP(Network Time Protocol). The femtocell should be synchronized with the core network of the operator. Another proposal is suggested by company known as Zarlink. As mentioned by them, IEEE1588 Advanced Timing over Packet (known as ToP) is installed on both client(Femtocell AP) and server side(RNC). Each of the packet transmitted from RNC are time stamped. Similarly when packet is received at RNC, an ACK is returned immediately. Using this ACK, client adjusts its clock. Femtocells also often obtain timing information from neighboring macro cells(i.e. cellular towers). Crystal oscillators(OCXO, TCXO) can also used as stable timing reference in femtocell, but they are costly for user(customer) grade service applications. Cheaper oscillators can be used for the purpose.